The Charleston RiverDogs are known for many things, and chief among those many things is food. As longtime readers of this blog are aware, I have made an annual habit of dedicating a preseason post to their new concession options. And when I last visited Charleston in 2011, food and beverage overseer Jon Schumacher laid out a spread that included a Pimento Pickle Burger, a RiverDog, a Pig on a Stick corn dog, Kitchen Sink Nachos and, of course, the Pickle Dog. The Pickle Dog is no longer offered at RiverDogs game, sadly. And, even more sadly (from my self-centered perspective) Schumacher has left the team in order to open a restaurant of his own. This new establishment, Harold’s Cabin, is co-owned by RiverDogs co-owners Mike Veeck and Bill Murray. This may look like a corn dog — which would make sense, because it is — but it’s not just any corn dog. Playing off of one of Charleston’s signature dishes, this is a Shrimp-N-Grit Corn Dog. Of course, I would not be the one consuming such lowcountry ballpark specialties. That job, as always, goes to my designated eater. In Charleston, this individual was one Frank Monterisi. I took the below photo of Frank before tutoring him in the basics of food posing technique. Namely, do not block the entirety of the foodstuff with one’s hand. Frank, originally from New York, moved to North Carolina along with his family in 2003. A graduate of Clemson University, he relocated to Charleston in 2007 and currently works as a math teacher at a community college. He then washed it all down with two alcoholic milkshakes. These might not be much too look at, but they were a lot to taste. On the left is an Apple Pie Shake — Angry Orchard cider and vanilla ice cream mixed with an actual apple pie from Charleston’s Mudd Pie Girl Bakery. I think Frank should get a part-time job writing ad copy for the RiverDogs. On the right is a Palmetto Biscotti Shake — Biscotti cookie dough, vanilla ice cream and Palmetto espresso porter beer. Frank praised the “rich, almost coffee-like taste,” but I think he still had his mind on the Apple Pie Shake. 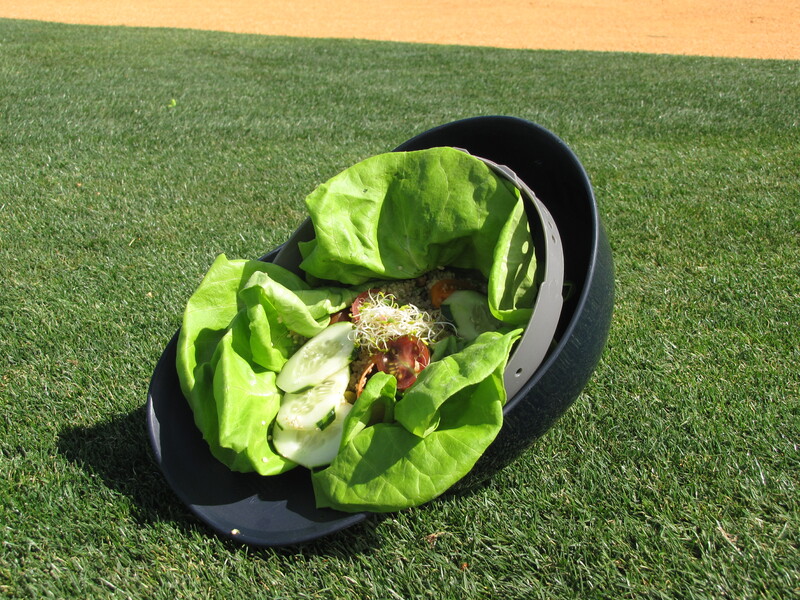 It was then time to lighten things up via the Harvest Salad, which, par for the Minor League Baseball course, is served in a helmet and feeds 2-3 people. But there are many ways in which to deviate from the norm, some ways more healthy than others. Shea soon arrived bearing a Double Chicken and Waffle Burger, and this thing looked so good that I had him explain it for posterity. There was no time for further reflection, for Jay Weekley is a relentless man. In Jay’s right hand (on your left, dummy) is a Hawaiian Dog. It is topped with pineapple relish, pineapple, red onions, pickled okra, “a little cilantro grown here at the stadium” and house-made lemon aioli. In Jay’s left hand (that would be your right, hockey puck) is a Southern Kimchi Dog. That one has shredded collard greens, locally-made kimchi, sweet piquant peppers and a ginger-soy dressing. Frank, like me, is a single man. 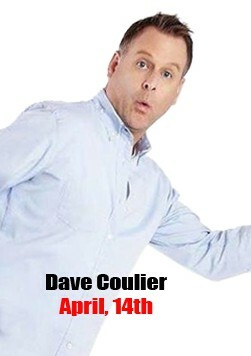 That makes me an expert in online dating profile pictures, and I do believe that this would be an excellent one. Good luck out there, Frank. Things had, by now, crossed over into the realm of the ridiculous. Next up was one of the RiverDogs’ new rice bowls. The Southwestern Chicken Bowl, to be exact, consisting of yellow rice, chipotle chicken, house-made corn salsa, cilantro coleslaw, black beans and lime crema. I took a closer look. Too close, probably. Loaded Nachos without the Nachos is simply “Loaded”, which is how Frank felt at this juncture. Fortunately, Frank had hit the end of his designated eating run. Asked to sum up his experience, he snapped to attention delivered a final summation. Now that I think of it, has anyone checked on Frank recently? For all I know, he could still be passed out on a plastic picnic table. But like most endeavors that end in such a fashion, I’m sure it was all worth it. 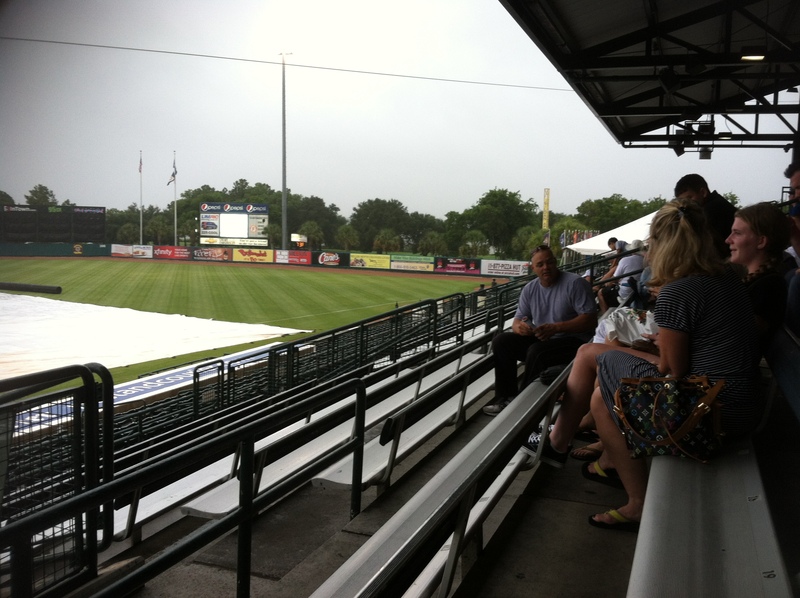 To see all my posts from my May 9 visit to the Charleston RiverDogs, click HERE. To see all of my posts from my May 2016 Carolinas Road Trip, click HERE. To see all of my “On the Road” posts, click HERE. If interested in seeing posts covering a visit to a particular team, search for that team’s name in the blog search bar (it’s to your right). When this Charleston RiverDogs narrative left off, I had just thrown a ceremonial first pitch perfect strike. This flawless spherical missive gladdened the hearts of all in attendance on this Monday evening at Joseph P. Riley, Jr. Park, but while a lesser man would have rested on his laurels I immediately got back to work. The first several innings of the ballgame — an eventual 8-3 RiverDogs victory over the visiting Hickory Crawdads — were spent with my designated eater. This will all be documented in the next post. When that task was complete, I rendezvoused with promotions director Nate Kurant (formerly of the Dunedin Blue Jays) at a location on the third base side of the ballpark. Once there, I was immediately reminded that this Monday — like all Mondays in Charleston — was “Bark in the Park” night. It was also, regardless of canine admission policies, a beautiful night. A beautiful night…for baseball! The majestic dog seen two photos above was on the verge of competing in a “sit or stay” on-field contest against another massive (albeit fluffier) canine. The goal was to be the first dog to obey his (or her) owner’s command to sit and stay in a hula hoop placed on the field. Neither contestant seemed too interested in this endeavor, but it was the other, fluffier, dog that won. 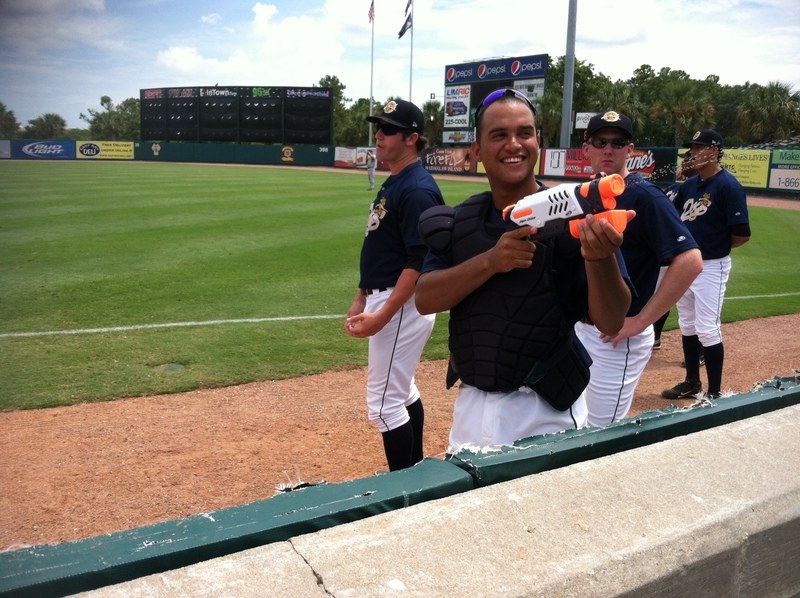 Another great moment in Charleston baseball history, I’m sure. One great moment begets another, as Nate and I proceeded to the control room in order to oversee the debut of a Bark in the Park-themed “Simba Cam.” The goal was to have fans hold their dogs triumphantly in the air — ala the Lion King — but really everything was fair game. Lots of laughs were had by all, particularly when a woman held up her corn dog (as seen in the right hand monitor). “That went as well as we could have hoped,” said one control room denizen after all was said and done. In Minor League Baseball, as in life, this is always the goal. I then returned to the third base dugout, in order to participate as a contestant as a between-inning ribbon dance contestant. I’d be representing the third base side of the stadium, competing against a counterpart on the first base side. As always, the victor would be decided by applause. In time-honored Minor League Baseball between-inning contest fashion, getting in the corn suit was a case of “hurry up and wait.” The pace of the game noticeably slowed down (there was a pitching change at one point), and the third out of the inning started to seemed like it would never come. In lieu of plotting a coherent and crowd-pleasing ribbon dance strategy, I sat around and took selfies while lamenting my latest ludicrous stint in ballpark purgatory. Almost immediately after posting the above tweet, responses like these started appearing in my timeline. I don’t think I look all that much like Ben Roethlisberger, but I guess the dissimilarities are less apparent when wearing a corn suit. Call me Ben Roeth-Biz-Berger. I guess that’s what I was going for here? At any rate, I lost the ribbon dance-off by a significant applause margin, as apparently my first base side counterpart was the Mary Lou Retton of vegetable suit dancing. He started things off with a series of cartwheels while I was tip-toeing around plotting for a payoff that never came. Still out of breath but no longer wearing a corn suit, I joined RiverDogs broadcaster Matt Dean for an inning on the airwaves. Once my time with Matt was said and done, there was almost no baseball left to be played. As the RiverDogs put the final touches on their victory over the Crawdads, I posed for a picture with RiverDogs co-owner Bill Murray. When there was only one set of footprints in the infield dirt, it was then that Bill Murray carried me. I also paid a brief visit to the RiverDogs concourse “Memory Booth”, which is a pretty cool idea. There is an iPhone camera mounted in the booth. Fans who step aside are simply instructed to press the camera icon and then relay their favorite Charleston baseball memory. I guess my favorite memory is that time I danced on the field while dressed like a piece of corn. Remember that? While on the verge of leaving the ballpark, it occurred to me that I had not yet written and disseminated a groundbreaking and subversive ballpark joke. I quickly pressed Nate into service, using his last name (Kurant) as the punchline. Brilliant, as usual. There was one more interesting — and unexpected — element left in my evening. Upon leaving the ballpark, RiverDogs operations director Philip Guiry asked if I wanted a ride to my hotel. Next thing I knew, I was riding in the breeze in the back of an ’82 El Camino. Thanks for the ride, Philip. 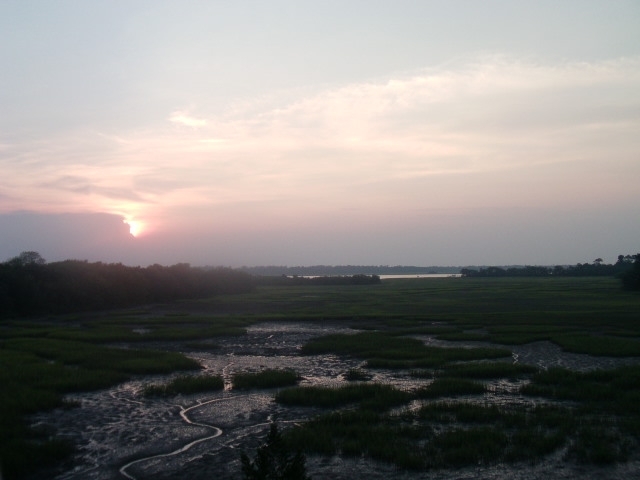 And goodnight, Charleston. I’ve never been one to disregard politely-worded written requests, especially when they come from Minor League mascots, so I dutifully put the ball in my road trip luggage and it traveled with me from New York City. 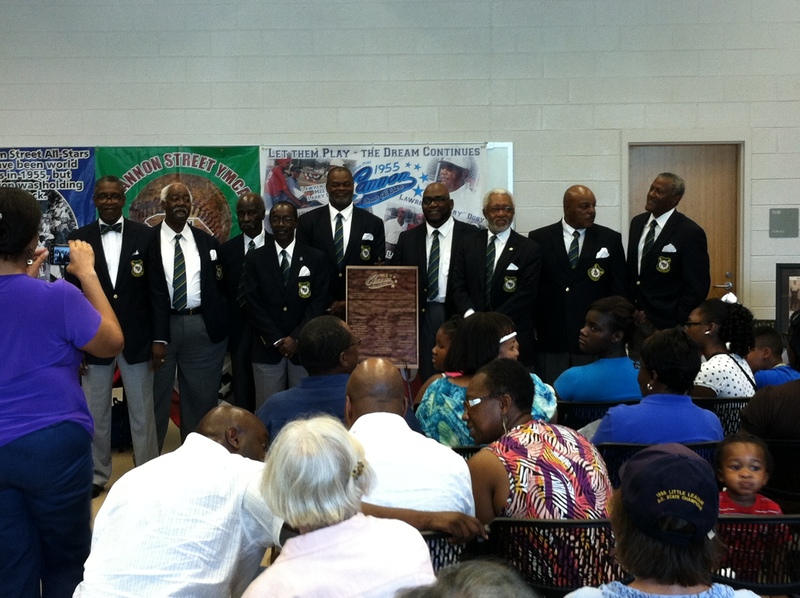 On May 9, as scheduled, the ball and I arrived in Charleston. …I arrived at the abundantly leafy front entrance of the ballpark. Once I got the to the gates (which had not yet opened to the public), I heard a voice from on high. “Ben Hill,” the voice said. The voice belonged to Riverdogs director of operations Philip Guiry, who, after stringing lights among the trees below, was doing his best not to electrocute himself. 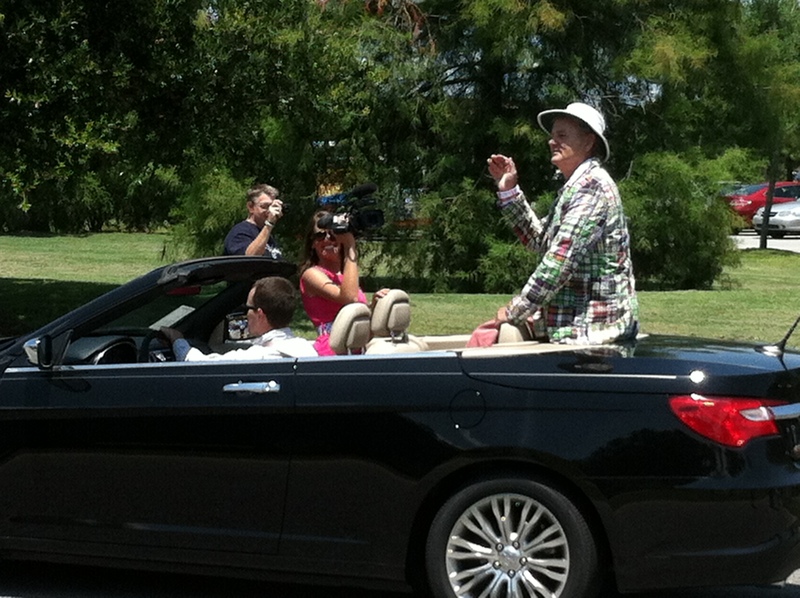 Life apparently got in the way of those ambitious death plans, because here he is in Charleston. Before resuming his cord untangling duties, Philip made a point of showing me an unlikely mural which can be found on the concourse: Charlie T. RiverDog at the Last Supper. It’s easy to miss, however, as it is located on the inner portion of a concession kiosk conglomeration. Philip had work to do, so he asked promotions director Nate Kurant for advice on how to get rid of me. They needn’t have worried. Taking inspiration from Andy Nelson the peripatetic muralist, I just sort of shuffled off. Here’s what the concourse looked like, shortly after the gates opened. Mondays are “Bark in the Park” nights, which are always a crotch-sniffing good time. 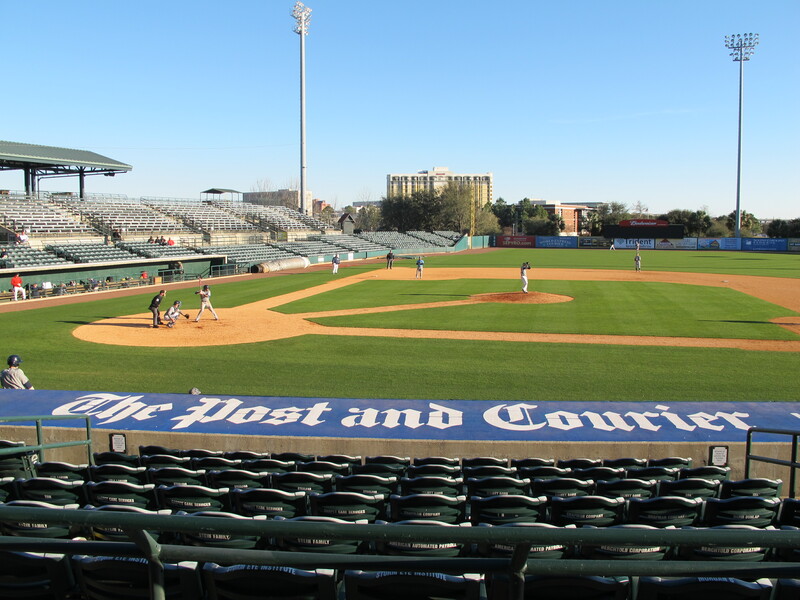 The first base side of the ballpark features a scenic view of the swampy Ashley River surroundings. Clearly, it was a beautiful night. A beautiful night…for baseball. My wanderings then brought me to the press box. Shortly after entering, Nate yelled “Ben! Fox! Fox!” I just assumed he was letting everyone know that I am a total fox, and maybe he was. But, if so, his urgent exhortations had a dual purpose as there was an actual fox running across the field. After fumbling about with my camera, I snapped this photo just as the fox was about to disappear into the dugout. After recovering from this brief encounter with wildlife, my wanderings resumed. These two young boys were practicing their synchronized berm-running routine. My next stop was the field of play because, if you’ll recall, I had a first pitch to throw. Charlie T. Riverdog, the ball-mailing mascot, was waiting for me. I summarily threw a first pitch strike. How do you know that it was a strike? Because I never lie. When this narrative resumes, a game will have just begun. But, for now, I’m just gonna shuffle off. 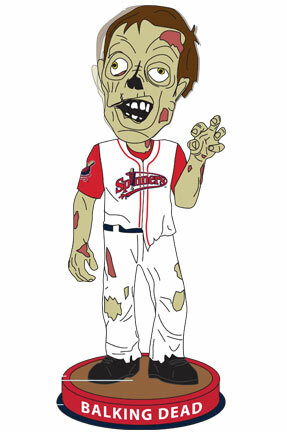 Ballpark Character: Another day, another “Bark in the Park” promo. 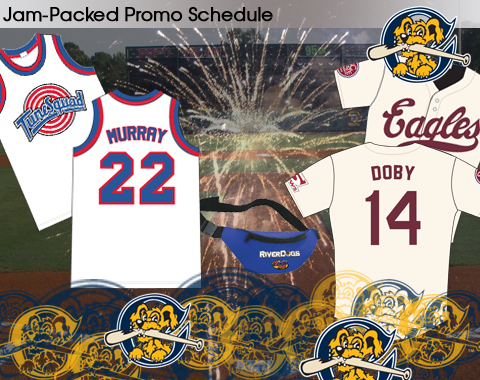 As part of the festivities, all three winners are invited to come to Medlar Field at Lubrano Park and pick the promotions of their choice for that night. The Spikes will make every effort to fulfill any choice each winner makes while adhering to applicable laws and regulations. I’m not sure if having carte blanche at the ballpark would lead me to create an evening of giraffes and plaid, but to each his own. Maybe the Spikes could get this kids clothing store to sponsor it. Finally, the night will feature an appearance by David Smith, the Human Powerball Cannonball. There’s never not a good time to post a Human Cannonball video. The Spikes are encouraging the three “newly minted tycoons” to call them at 814-272-1711 to get the “Ball” rolling on this promotional endeavor. What are the odds that one of them picks up the phone? I’d put it at something like one in 292 million, but, hey, ya never know. While the Spikes were looking for the Powerball winners today, the Charleston Riverdogs engaged in the far more manageable task of identifying the losers. See? It pays to play. 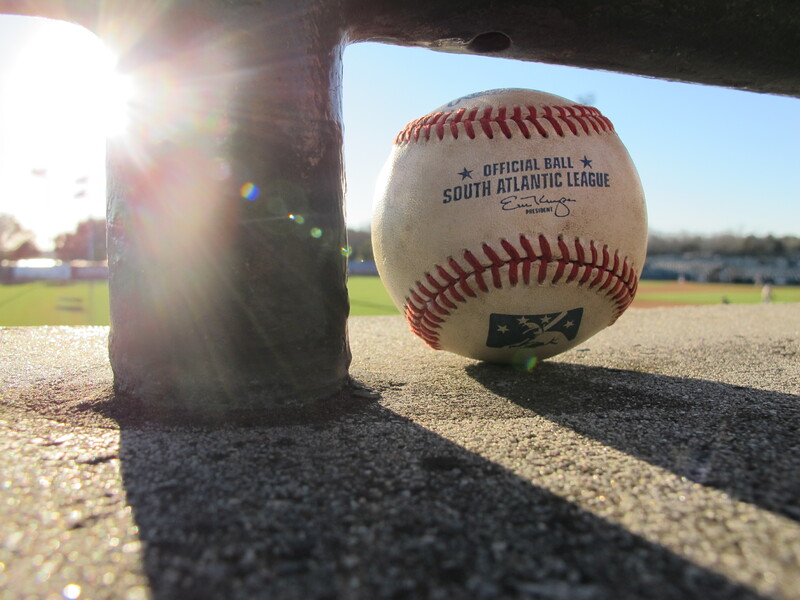 Charleston RiverDogs 2015: Food Explosion! An annual tradition here in the land of the Biz Blog — or Bizbloglandia, as some have taken to calling it — is to dedicate a post to the Charleston RiverDogs’ latest food offerings. And for good reason! In recent years, the RiverDogs have graced us with Beer Shakes, the Homewrecker Hot Dog, the Pickle Dog , the Pig on a Stick, Pimento Pickle Burgers, duck and venison sausages and much, much more. Ramen noodles sautéed with an orange teriyaki glaze, julienned snow peas, carrot ribbons & green onions. 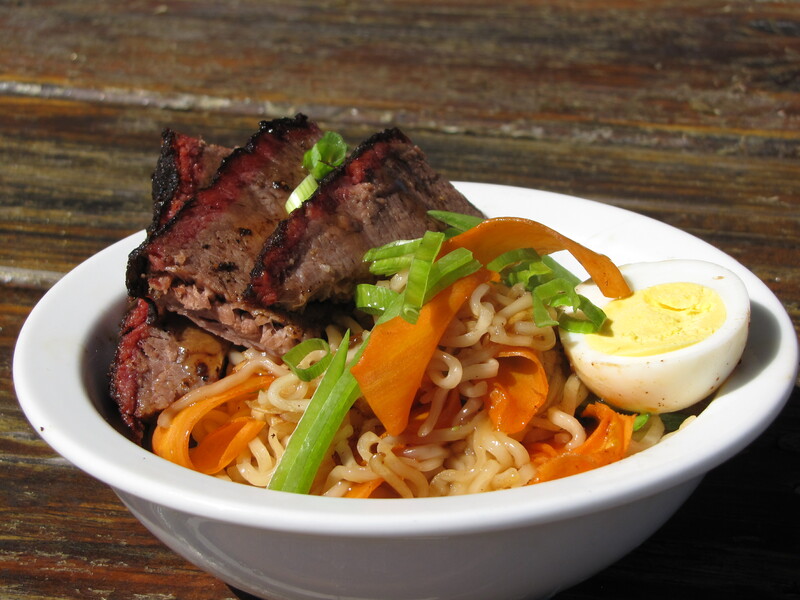 Topped with sliced smoked brisket and a hardboiled egg. 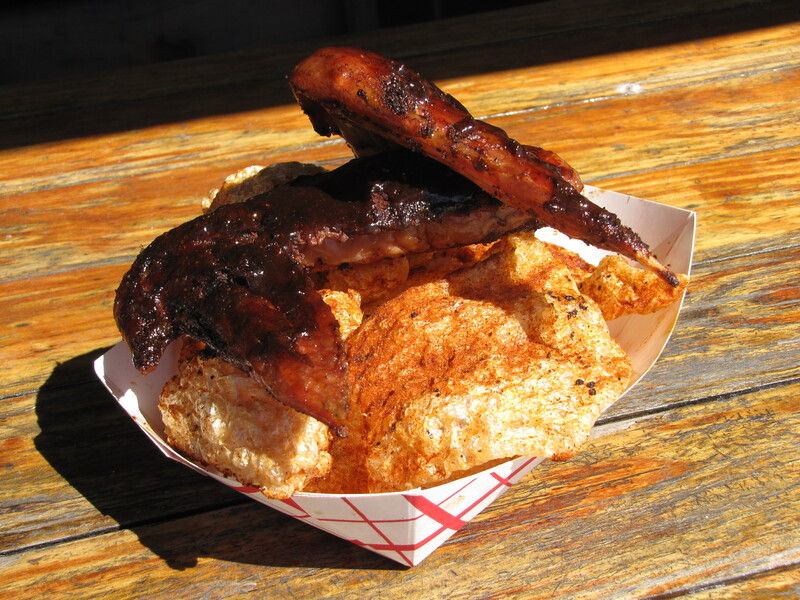 Two slow smoked 1/2 pound turkey wings with a blackberry sage BBQ sauce served over in-house cooked pork rinds. 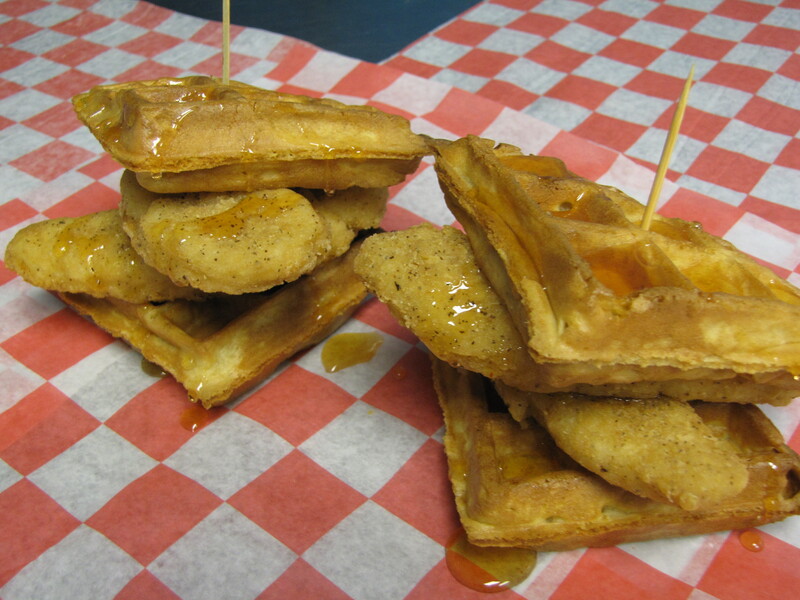 Chicken tenders stacked between a Belgian waffle and drizzled with a smoked honey and Sriracha glaze. 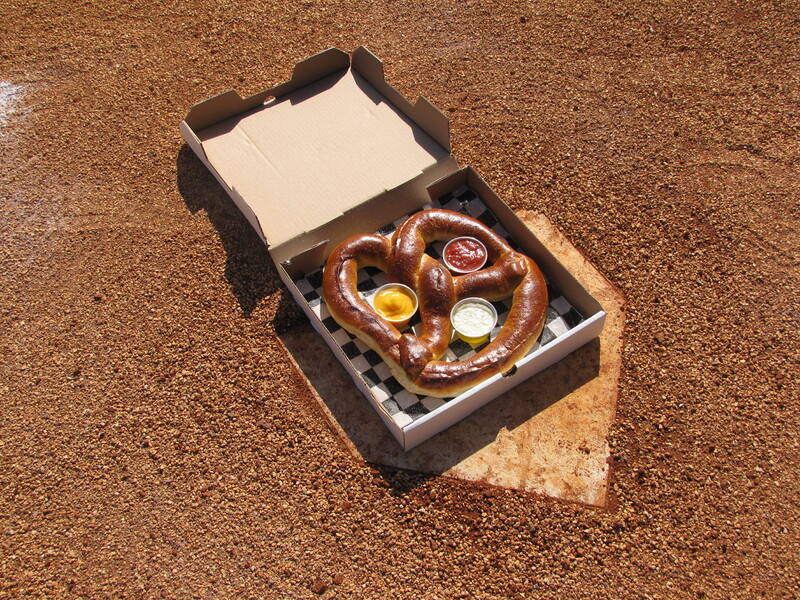 A giant 24 ounce soft pretzel served in a pizza box with marinara, garlic butter and cheese sauce for dipping. An entire hydroponic butter leaf lettuce head stuffed with a buttery quinoa mixture. The mixture includes grape tomatoes, edamame, fresh herbs and carrots. Topped with sprouts, sunflower seeds and a creamy avocado dressing. All served in a replica baseball helmet. 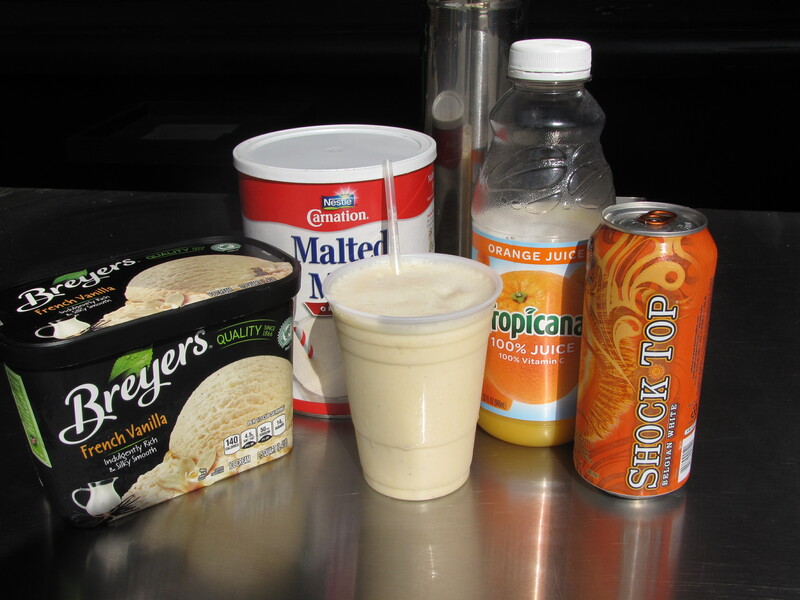 Shock Top beer blended with vanilla ice cream, OJ and orange flavored simple syrup. Low Country Taco: Smoked pulled pork, slow cooked collards, and mac n cheese layered into a flour tortilla and topped with a Memphis style BBQ sauce. Southern Kimchi Dog: Collard greens, kimchi and sweet piquante peppers tossed in soy sauce and toasted sesame oil. Piled on top of a Hebrew National hot dog and finished with a garlic Sriracha sauce. When it comes to chocolate-covered pepper bacon, it seems that no explanation is necessary. Thanks, as always, to Schu for providing me — and by extension, you — with another batch of delectable food information and pictures. Schu make the world a better place. In other news, my first road trip of the season is imminent. If you’ll be at one of the following locations, or have recommendations regarding who I should talk to at the ballpark, or suggestions regarding what I should check out in the general area, or anything else at all, then please get in touch.